June 8, 2018 Update: The Spalsh Pad concrete was poured this past week. We are now in the final stages of wrapping up the project. The Grand Opening is set for June 30. We have enough funding to complete the project; however, we are still accepting donations. Personalized bricks will be installed after the grand opening by replacing a blank brick. Any money raised beyond the cost of the project will be spent on other projects in the Collins Park. The first extra project will be to update water fountains in the park. 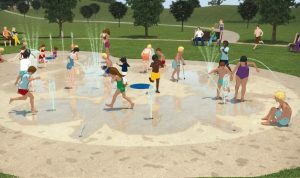 April 22, 2018 Update: Lions Splash Pad project is still proceeding with an expected Grand Opening of June. As of today, 120 donors have helped raise $79k for the project. The project cost has slightly grown to $85k. You can still donate to the project and receive personalized bricks. Construction Photos are updated as project moves along. 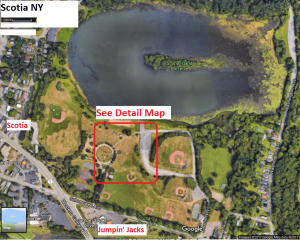 The Scotia-Glenville Lions are raising funds to donate a Lions Splash Pad to Collins Park. A Splash Pad is an fountain with no standing water that provides a place children (and adults) to cool-off on the hot summer days. For decades, Collins Park had a public beach that many people enjoyed. Unfortunately after Hurricane Irene in 2011, the massive flooding deposited sediment in the lake that has made the lake too cloudy to safely open. 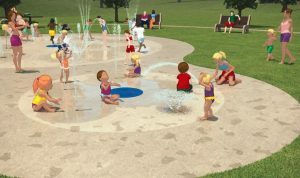 A Splash Pad will be a nice alternative to the beach. 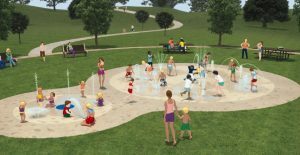 Below are the latest renderings of Lions Splash Pad. There will be a large 45-foot diameter area and a smaller 25-foot area dedicated to younger children with a concrete surface area of roughly 2000 square-feet. The smaller area will have less intimidating water jets for younger children and will help to physically separate age groups to avoid accidental bumps and bruises. A foot-activated button in each area concrete will turn the Splash Pad on for 3-5 minutes; the water jets will cycle on and off with some choreography. A timer will control when the water jets operate. 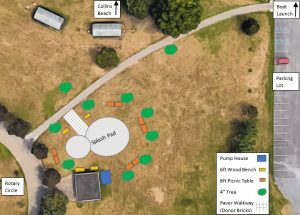 Lions Splash Pad will be near the Collins Beach area and park bathrooms. Picnic tables, benches and new shade trees will complete the area. The overall plan for the project is shown below.